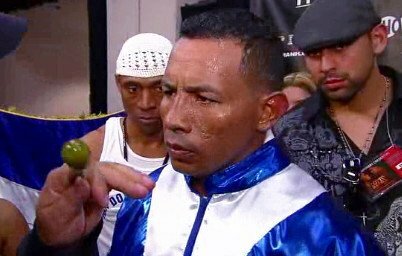 He fought, he drank beer, he smoked cigarettes, and he gave us plenty of entertaining nights and fights along the way, but “El Matador” Ricardo Mayorga surely reached the end last night in Russia. The 44 year old, having actually won his previous fight this past April (over a 12-17-1 Jaudiel Zepeda who he TKO’d) retired on his stool after nine rounds against unbeaten Russian Andrey Sirotkin, now 14-0(4). Mayorga, who gave it a go while he was able, in the early rounds, falls to 32-10-1(26) and it is to be hoped this will indeed be the final tally for the wild man from Nicaragua. Southpaw Sirotkin, 12 years the younger man at the age of 32, scored the biggest win of his career in stopping the former welterweight and super-welterweight champ to win the vacant WBA international super-middleweight strap, and that’s saying something. Your guess is as good as mine as to how far Sirotkin can go and whether or not last night’s win means anything. But Mayorga, at one time a genuine star and possibly even a close to great (if wholly unpredictable/unreliable) fighter who attracted fans from all over the world, must now call it a long overdue day for the sake of his health and well-being. It is a good thing Sirotkin is no big puncher (just 4 stoppage wins to his name). At one point in time, back in the early to mid 2000s, Mayorga could seemingly go to war with any big puncher. Mayorga scored some excellent wins during his prime – beating, amongst others: Vernon Forrest (twice), Michele Piccirillo, Fernando Vargas and Andrew “Six Heads” Lewis. A former WBC/WBA welterweight champ and also a WBC super-welterweight champ, Mayorga earned big pay days and he gave us all a thrill. But like so many other big names, Mayorga was unable/unwilling to call it quits when his skills had long deserted him; fighting on as he did after his 2011 stoppage loss to Miguel Cotto. Mayorga’s last biggish fight came in the summer of 2015, when he was stopped by fellow veteran Shane Mosley in a needless return of their entertaining 2008 battle. Now, in being hammered by Sirotkin, the end has surely, almost absolutely come. Let’s hope Mayorga can find peace, as well as something to do, outside of the ring. Previous boxing news: Lefebvre Still WBF World Champion After Special Fight With Koasicha!